NASA's Juno spacecraft captured this image of Jupiter on April 1, 2018. Citizen-scientists Gerald Eichstädt and Seán Doran processed data from Juno's JunoCam instrument into this stunning view. A gorgeous photo by NASA's Juno spacecraft shows Jupiter as you've probably never seen it before. "This new perspective of Jupiter from the south makes the Great Red Spot appear as though it is in northern territory," NASA officials wrote today (May 21) in a description of the image. "This view is unique to Juno and demonstrates how different our view is when we step off the Earth and experience the true nature of our three-dimensional universe." The newly released photo is a composite of multiple images snapped by Juno's JunoCam on April 1, during the spacecraft's most recent close flyby of the solar system's largest planet. Juno took the constituent photos from a distance of 10,768 miles (17,329 kilometers) to 42,849 miles (68,959 km) above Jupiter's cloud tops, NASA officials said. The $1.1 billion Juno mission launched in August 2011 and arrived at Jupiter in July 2016. The probe orbits on a highly elliptical path, zooming above the gas giant's poles once every 53 days. The solar-powered Juno makes most of its scientific observations during these close approaches, gathering information about Jupiter's composition, structure and gravitational and magnetic fields. 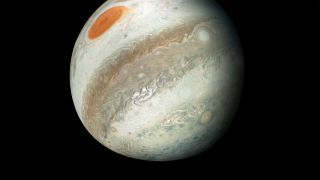 The probe's data should help researchers better understand how Jupiter, and by extension the solar system, formed and evolved, mission team members have said. The April 1 encounter was Juno's 12th science flyby of Jupiter. The 13th will occur on Thursday (May 24).